13 to 30 was created and performed in Chicago, Illinois in 2012. 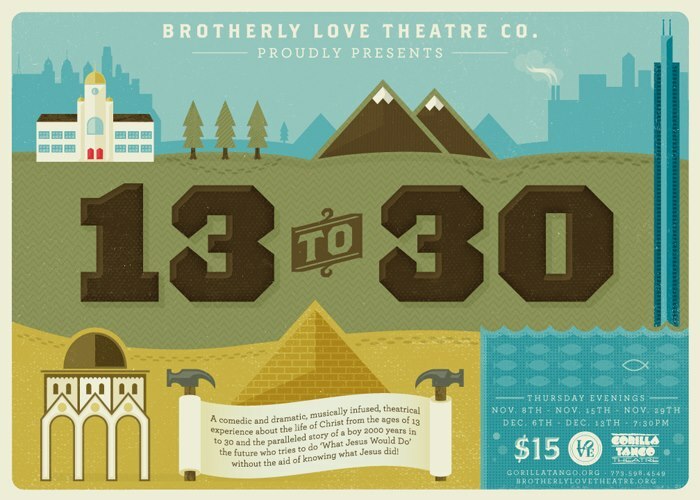 Brotherly Love Theatre Company proudly presents 13 to 30. 13 to 30 is a new play from creator David Henry Wrigley and the ensemble at Brotherly Love Theatre Company. It is the story of Jesus (Yeshua) from the age of 13 to the age of 30. Though many people have little insight into those 'lost years of Christ', there is actually a wealth of speculation and concepts about what Jesus did during those years. This show is a combination of comedy, music, drama, dance, narrative, sketch, and exploration that is sure to expand our understanding of who Jesus was and is. The narrative of Jesus is paralleled by the narrative of a boy 2000 years in the future who, from the ages of 13 to 30, tries to understand his place in relation to history's most influential figure without having the aide of knowing what Jesus actually did, thought, or felt! WWJD? Let's find out together!